It was a heady political year in India. The draconian Emergency of Indira Gandhi had just ended in 1977. A new set of politicians had stormed to power. Coca-Cola, that quintessential symbol of American capitalism, had been thrown out of India. And now it was time to experience “The Great Indian Taste”, the punchline synonymous with Campa Cola. The desi brand was an instant favourite among the youth when it was launched to quickly replace the exiting Coca-Cola. Brand guru Alyque Padamsee prefers calling it an “imitation brand”. Campa Cola has had a quiet death since. A well thought-out youthful advertising and marketing strategy was carefully carved out keeping in mind its primary target audience – the young Indians. Besides the youth appeal, the advertisements also emphasised the brand’s nationalistic credentials – after all, it was a ‘Made in India’ product. Indians today associate Bollywood superstar Salman Khan with the toofani brand of cola called Thums Up. But decades before this, Khan was actually a teen brand ambassador of Campa Cola. He was all of 16-years-old when he starred in a Campa Cola ad with the young dancing hero Tiger Shroff’s mother Ayesha. Pure Drinks Group was responsible for shaping the Indian soft drink industry. In fact, the same company had introduced Coca-Cola in India in 1949. The company was the sole manufacturer and distributor of Coke till the 1970s until the American cola giant was asked to exit the Indian market, along with IBM by industries minister George Fernandes. 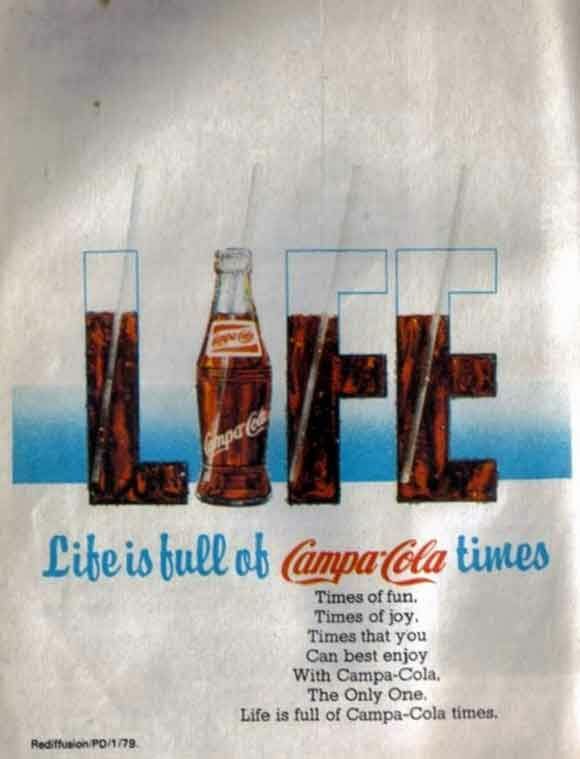 Later, Campa also launched orange and lemon-flavoured drinks. 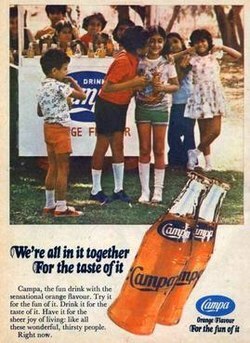 The print ad showed a group of children playing with Campa Orange. “We’re all in it together for the fun of it, for the taste of it,” the punchline said. 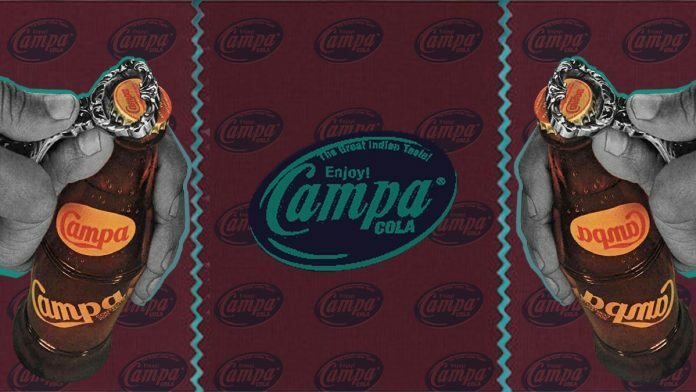 The biggest competitor for Campa Cola was Thums Up in its pre-toofani avatar, also launched in 1977. But even before India’s economic reforms in 1991, a new cola war started in India. This was when Pepsi tried to enter the Indian market under former Prime Minister Rajiv Gandhi. There was tremendous opposition to it. To smooth the entry, Gandhi even set up the food processing industry. His government said farmers can supply potatoes and tomatoes for Pepsi’s ketchup and chips. Pepsi launched its drink as Lehar Pepsi, in a joint venture with Punjab Agro. Thums Up co-owner Prakash Chauhan bitterly opposed the entry of Pepsi and the re-entry of Coke. He even alleged sinister political coups and campaigns by these American giants in South America, and lobbied hard through parliamentarians. But he eventually sold to Coca-Cola, and Thums Up got a new lease of life. It was 1993 and India’s economic reforms measures were well underway. But Campa Cola slowly wilted in a market dominated by aggressive American cola wars. Around 2000, its bottling plants were closed in Delhi. “I am still very fond of those cola brands and they were good, in fact, better than the global brands. Why else do you think Coke had to re-introduce the Indian brand name Thums Up, which is doing very well in the market,” says Simran Kohli, an IT professional. This article has refreshed old memories. Just wonder if the death of Campa Cola was connected to death of its owner.